So you’ve got your first belt test coming up. Here’s some training advice! Step 1: Go to class and learn. In order to take the belt test, you need to learn your kicking combination and your form. If you do not know these, you will not be ready to test. If this is your first test, you will also need to learn the basic 6 movements and the basic 10 movements. Step 2: Get your stripes. In order to test, you need 4 stripes. Red stripe for kicking, Blue stripe for form, Yellow for breaking and White for discipline. BTW, a form is completed by parent or guardian in order to earn the White stripe. Step 3: Build stamina and strength. During the test, you will be doing push ups, situps and other physically straining activities. Knowing forms and kicking is only part of the test. Practice pushups and running, or do other physical activities during class and at home to make sure you have the stamina to take the test. Step 4: Practice more. Some people think that once they earn their stripes, they are done. However, the reason the test exists is to prove that you have learned. It does not matter if you have your stripes, if you don’t know the kicking and form. You should practice during class and at home. And that’s it. 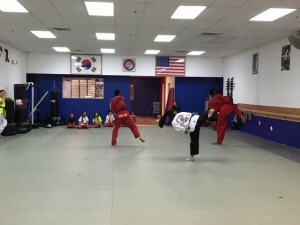 After this you should be ready to take your first belt test, or any other belt test. Extra tip: Take advantage of the makeup test. If you aren’t ready by the Friday of the test, take another week to practice and take the test later if you need extra time. ← Have a Super Sunday!